Following simple instructions, you can make your own grappling hook without having to shop for it online or anywhere else. If you are a fan of ninja movies, you would be no stranger to grappling hooks but since you cannot go around using one with a ninja outfit, you might as well make one only to be used for a Halloween party. You can also use your grappling hook for pulling doors, or dragging the television remote control towards you on a lazy afternoon. You require three paper clips to form your hook. Hold one of them in your hands and bend the outermost end of the paper clip. Bend it towards the curve which is U-shaped until perfectly straight. Repeat the process with the other two paper clips as well. You now have to thread the inner most end of one clip through the middle of the other clip in order to lock two paper clips together. In this step you need to pass the thread of the third clip from the middle of one of the two clips which are interlocked together. The coiled parts of the paper clips which are locked with each other now need to be secured with a rubber band. In this step twist the rubber band firmly around the paper clips until it can no longer be twisted, which will help in binding the paper clips tightly. Now hold the ends of the straightened paper clips and apply a little force to bend them into a U shape. With this you will have a prominent grappling hook. Now you just need to get string for it. You can use a dental floss to make the string. 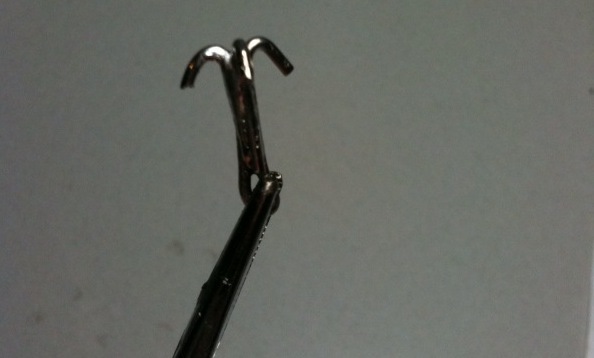 Run it through the middle of the paper clips so that the grappling hook is equally balanced. Make sure that it passes through the centre. Use a double knot to fasten the floss which will hold and release your paper clip hook into the air. Cut the floss according to the length of your desire or you can leave it long in order to grapple distant objects.